Due to the fact that the kitchen is such a hard-working space in a house, finding suitable window treatments is crucial. They have to withstand intense cooking activities and greasy vapors, while providing appropriate light control and privacy. 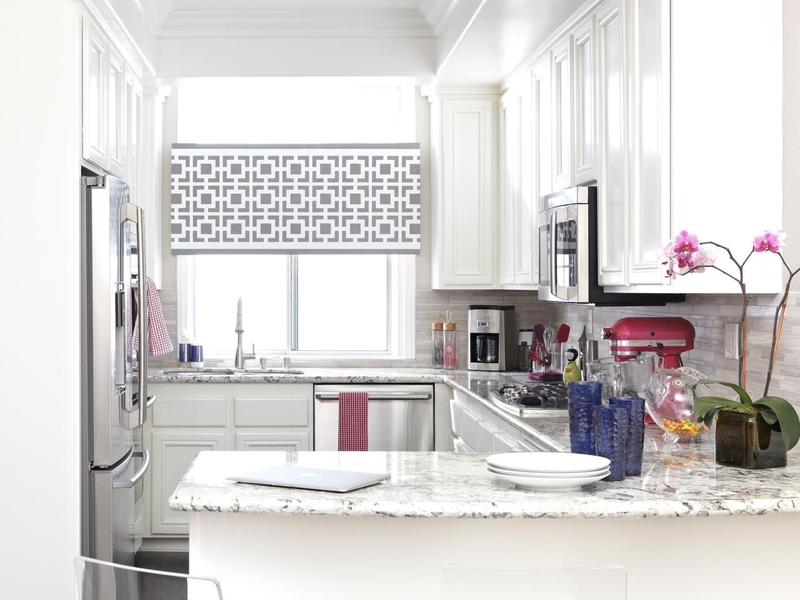 Also, a complete overhaul can cost a fortune, so just by changing outdated kitchen window coverings, this busy room will gain a refreshed look. A key factor to consider is quality. Going for fabrics that can be easily laundered or swapped will help keep your kitchen prime and proper all the time. Some manufacturers have come up with antimicrobial materials that are also moisture and dust-repellent, so purchasing such products will spare you from the hassle of constantly having to invest in new kitchen shades. 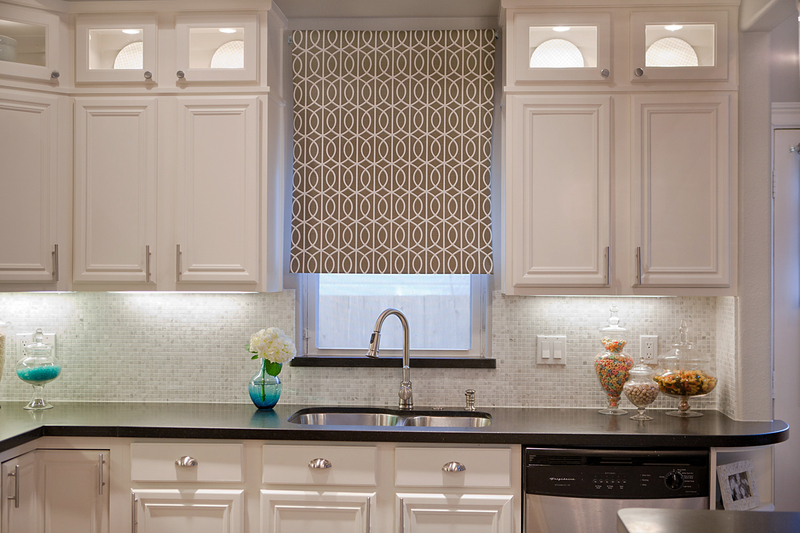 Texture and pattern have a lot to say in choosing the right kitchen curtains or blinds. On one hand, bold designs and striking colors can distract from old-fashioned tiles or aged cabinets, creating a daring contrast that exudes contemporary appeal; on the other hand, installing simple floor-to-ceiling white curtains with rich folds will impart a crisp Nordic look to your cooking area, making it look simple, yet chic. Woven shades always bring unbeatable refinement due to their blend of natural grasses, reeds or twigs, by adding textural detailing and unique hues; these organic materials are also highly-resistant to moisture and do not crack or fade, making them perfect for such a demanding environment. Wooden shutters or alternative wood blinds are equally charming thanks to the beauty of their flat or beveled slats that showcase the natural grain. What’s more, they are easy to clean using only soapy water and a cloth. The way light enters the kitchen is another essential aspect. 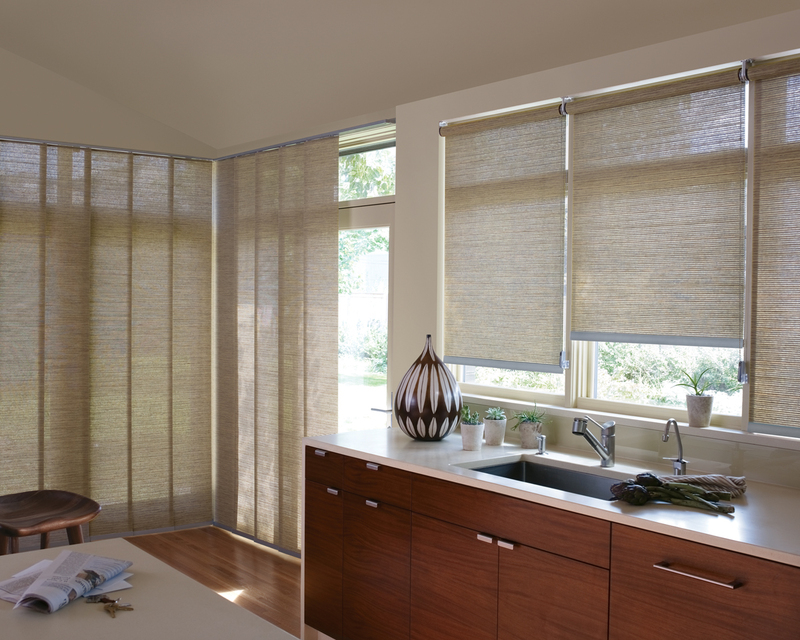 Sheer shades will diffuse sun rays, creating an inviting ambiance during the day, while counteracting the stark appearance of modern lines and stainless steel appliances. 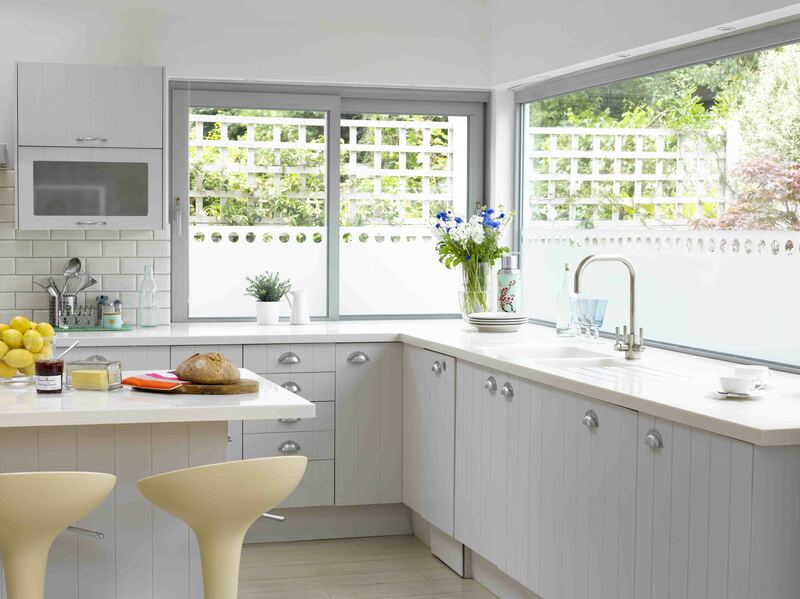 Both the size and location of your kitchen windows greatly influence the ideal treatments. Undersized windows situated above the sink or the counter top work best with smaller curtains made from easily washable fabrics like cotton or linen. Café curtains are adorable and have the advantage of not completely covering the view, while also providing privacy and a nice thing to look at while doing the dishes. Pair them with vintage-looking rods and embroidered hems for enhanced Parisian appeal. If the space allows you to, dress your kitchen windows with long curtain panels that drape to the sides. This way, the windows will look much larger. A great trick to balance the silhouette of small windows is to mount valances or toppers right above the top edge. These types of coverings do not require much fabric and can be the focus of your next DIY project; sometimes, a colorful beach wrap or an interesting throw will work wonders. And if you really want to push the envelope and get ultra-creative with kitchen design, you can go for faux window coverings; placing a natural barrier of indoor leafy plants on the window sill or setting a cute-looking adhesive film with a matte finish on the lower half of the window glass are equally effective solutions. 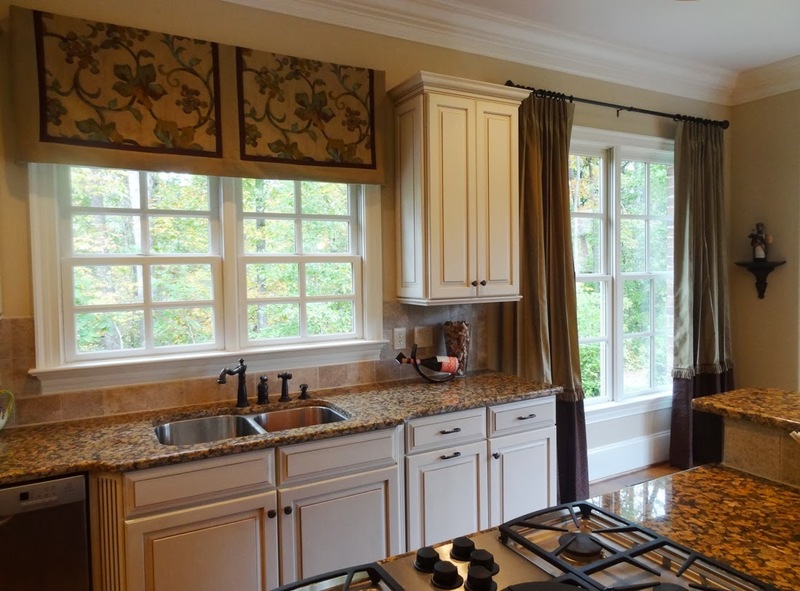 Pairing curtains and valances for kitchen windows will definitely bring depth and warmth to the space, by balancing the modern harsh lines of stainless steel appliances or complementing elegant cabinetry and cornices. Because the abundance of fabric will impart a sophisticated lavish look, you do not have to use costly materials. Additionally, the combination between these two types of window coverings will also help in dealing with small windows; for example, high-mounted valances and curtains draped to the side will make a window look larger, so you will benefit from natural light as much as possible when cooking or cleaning. 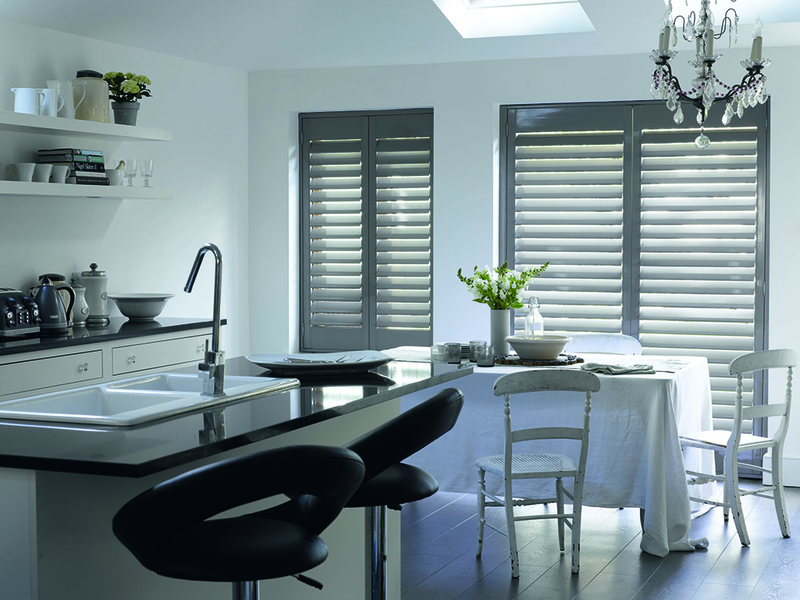 Shutters create a stunning visual impact and they can definitely be used to enhance the look of your kitchen windows. 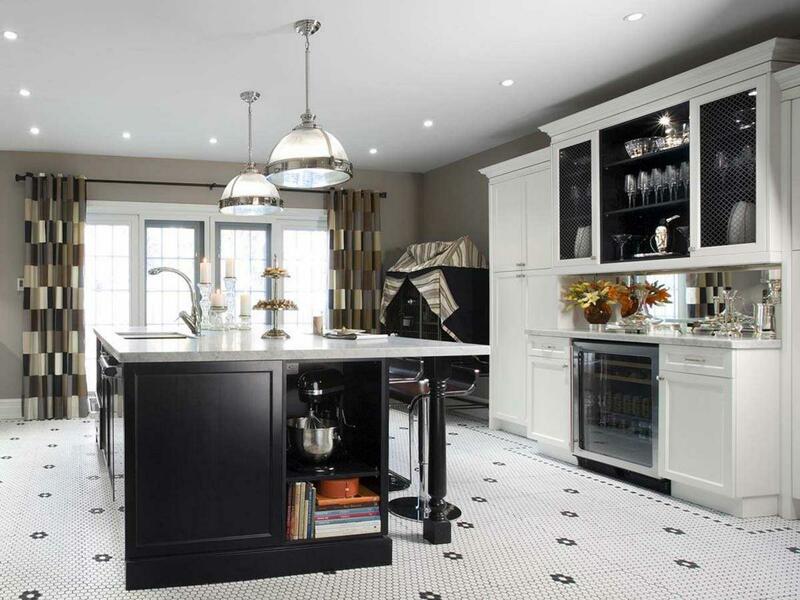 Having a retro, colonial appeal, their wooden louvers soften the stark lines of stainless steel appliances, lending a sense of coziness to the space. For shutters made from natural essences, opt for wider slats that reveal the superb wood grain; however, small windows will look better with narrower slats, so keep in mind their size while decorating. Nowadays, both synthetic and wooden shutters come with easy-to-clean finishes, so you can wipe them with soapy water in case they become greasy, making them ideal for heavy-duty kitchens. 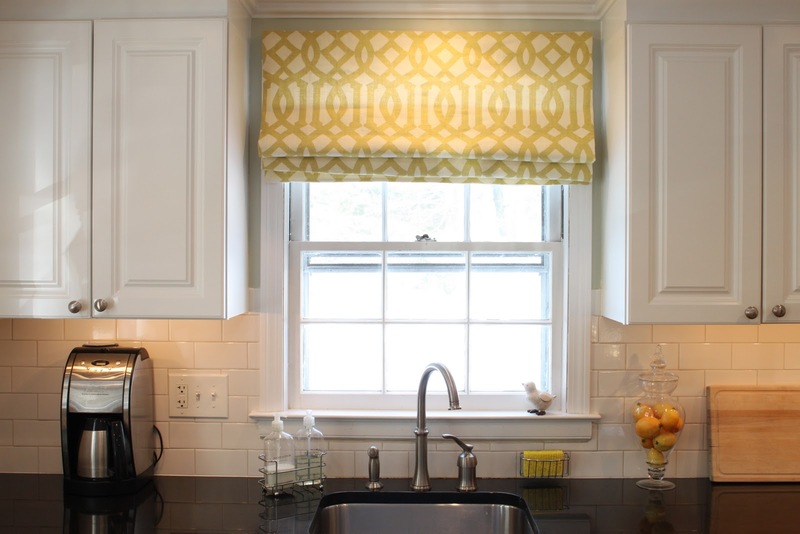 Valances are a minimalist, budget-friendly solution to accentuate your kitchen windows, due to the fact that they do not require much fabric and are easy to install, hence easy to change in case your old ones get soiled, which often happens with kitchen window coverings. They are also available in many shapes, so you can choose from straight valances for a crisp modern look, or from scalloped or pleated ones for their romantic appeal. 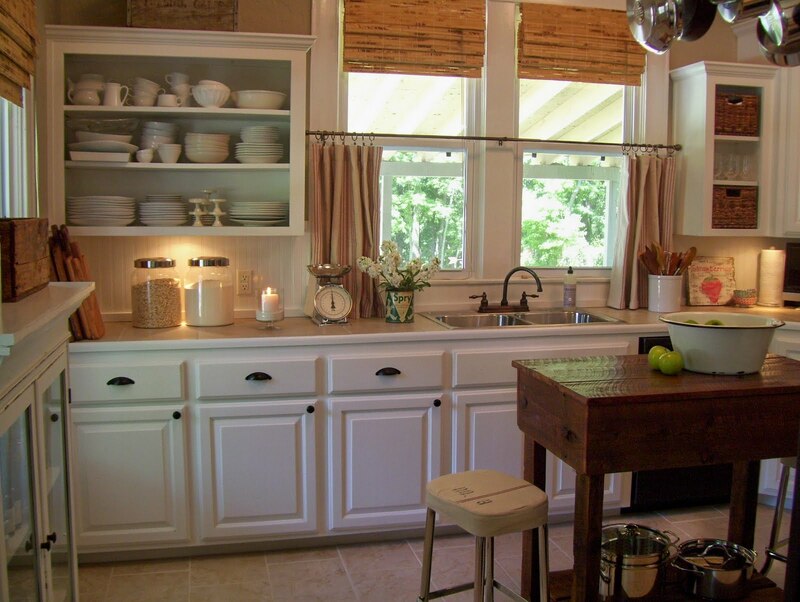 By stacking them with elegant ribbons or wooden buttons, you can add a rustic vibe to your kitchen. Furthermore, valances can be used to give the illusion of extra height to small windows by installing them right above the window frame. The classic black and white combination will never go out of fashion; therefore you can update the look of your kitchen windows using this two-tone mix. For a more traditional approach, opt for checkered patterns that will impart a homey vibe to the cooking space; daring geometrical shapes like chevron go well with minimalist lines, thanks to their stunning visual impact; fabulous designs inspired by Moroccan tiles or Arabic art will certainly liven things up. 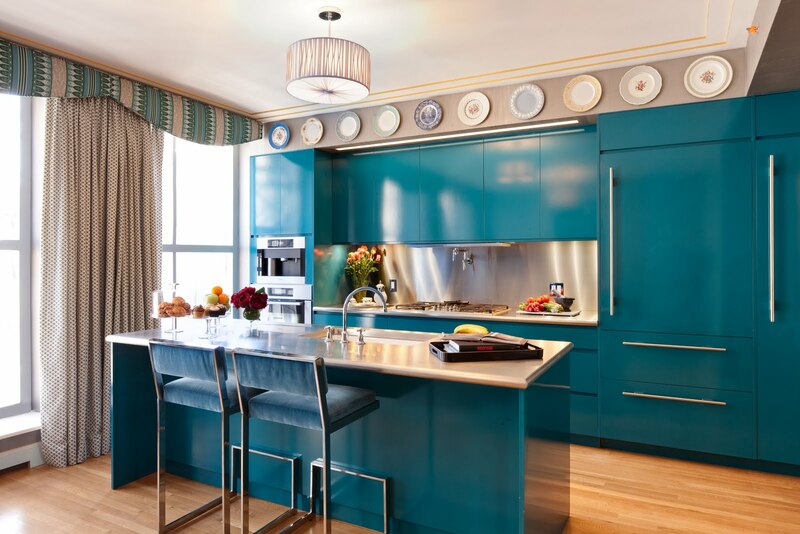 The great thing about these two contrasting tints is that they go with just about every other color and kitchen styling. DIY shades are the perfect solution if you want to personalize the look of small kitchen windows while having fun with the whole family. You can pick inexpensive materials with striking patterns that emulate designer fabrics, such as gift wrapping paper. Just make sure that the width of the paper roll is slightly larger than that of your kitchen window. 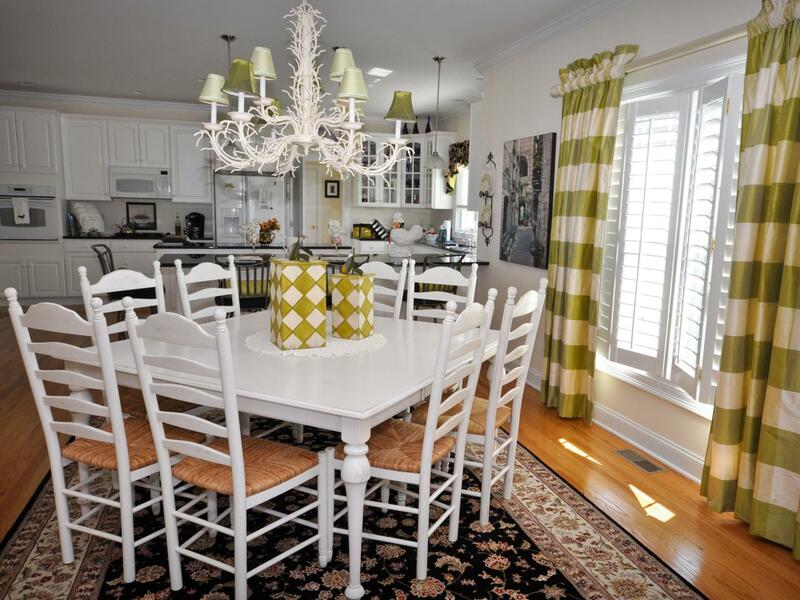 Also, textile beach wraps can bring tasteful pops of color, contrasting with neutral cabinetry. Another impressive solution is to use coffee bean bags; their textured look and bold prints will add depth and interest to your windows. Secure them with pins on the window frame and stack them up using hemp strings, for extra pizzazz. In case you want to avoid the hassle of finding the perfect fabrics for your kitchen windows or you are annoyed at having to constantly launder existing ones, then faux kitchen curtains will provide a great stress-free solution. Instead of installing rods and drapes for privacy and light control, you can place various pretty-looking pots of flowers or leafy plants on a shelf in front of the window. Their height and silhouette will liven up the décor while filtering light and the air in your kitchen; just pick moisture-resistant plant varieties. Another trick is to use an adhesive film with a matte finish and cool design that perfectly emulates Parisian café curtains. This way, your kitchen windows will always look crisp and clean. 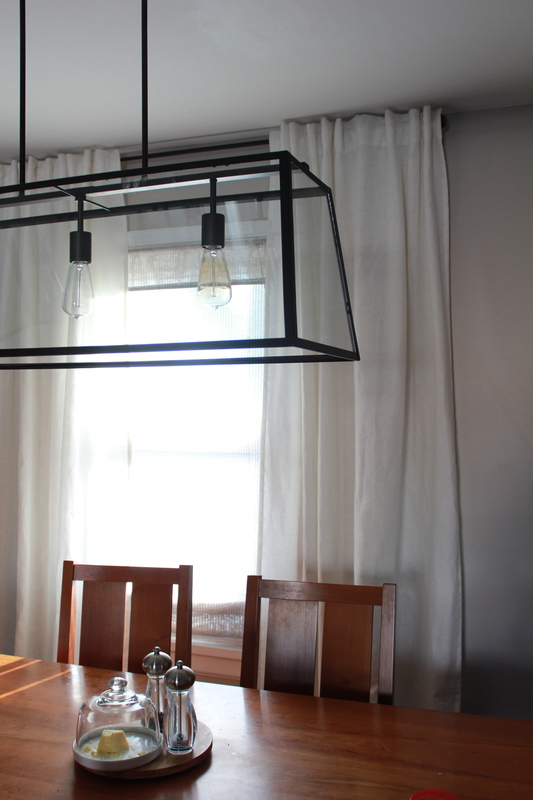 In case you are looking for a minimalist way to dress up your kitchen windows in order to benefit from natural light as much as possible, then window toppers are ideal. Not only are they decorative, but also easy to install. All you need is an antimicrobial, moist-repelling material, in order to withstand intense cooking. They can be made from inexpensive decorative fabrics that will add sophisticated splashes of color to neutral cabinetry, or from a simple cornice mounted on the upper edge of the window frame. Bamboo and other natural materials can also bring definition and edge to a small kitchen window, due to their textured finishes. Any kitchen, either contemporary or more on the traditional side, can be transformed with sheer shades that filter light in a dreamy manner. The use of natural light is very important in such an essential part of the house and your light-filtering needs might vary depending on the cooking activities or time of day. Sheer fabrics paired with room-darkening ones enable you to have complete control over your privacy while juggling with light and shade for a glamorous effect. Moreover, their light-diffusing characteristics will impart an elevated look to the space, thus making your kitchen appear refreshed and refined. Additionally, for your kitchen windows, go for materials that are not prone to soiling. Dressing your kitchen windows with ready-made curtain sets is fast and easy, but there are certain guidelines to be followed in order to avoid a tacky look. Over-embroidered or heavily ornate fabrics are not desirable, because they give a sense of clutter and often obstruct natural light. You want your kitchen to look as crisp and clean as possible, so look for neutral or simple geometric patterns that will subtly complement your cabinetry. Also, steer clear of coordinating sets that will make your kitchen windows look like supermarket displays. Variation is key, so pick up sets of curtains that do not have the same fabric used for drapes and valances. 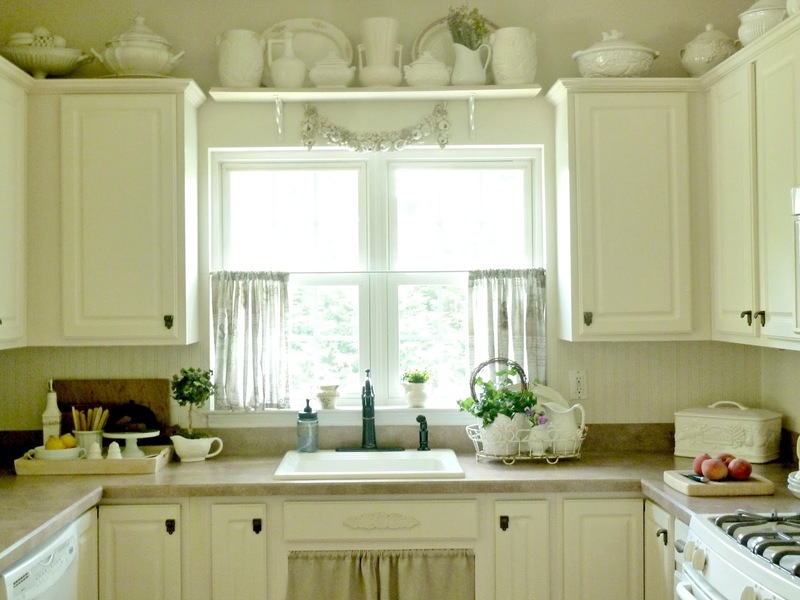 Short curtains work best for kitchen windows situated above the sink or the countertop. Not all of us have been blessed with great views, so short draperies made of lace, embroidered cotton or other pretty fabrics will offer a nice thing to look at while washing the dishes. 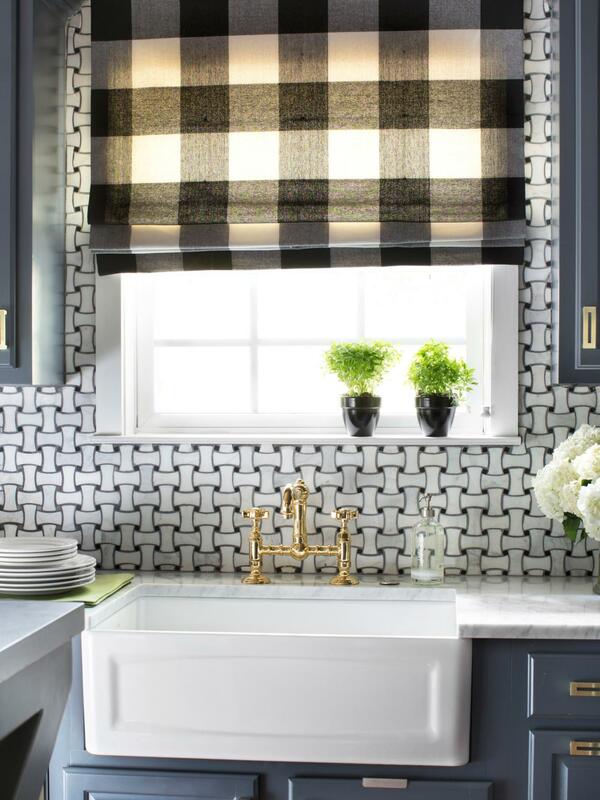 If you are after that old English cottage feel, then short kitchen drapes made from checkered fabrics will add instant panache. A cute take on this type of window coverings is to install café curtains, meaning drapes that cover only the bottom half of the window. They provide privacy while letting a good amount of natural light in, and are easy to change and launder if they become soiled. The kitchen is an important space in the house, but it is always prone to soiling and humidity to say the least. Regular window coverings might not withstand these harsh conditions, so going for long-lasting high-quality shades becomes crucial. With the Hunter Douglas Pirouette shades you can have it all. Their superior fabrics are moist and dust-repellent and do not require special cleaning, thus helping you to save time and energy. The manufacturer grants clients lifetime guarantee, so investing in such durable products is worth it. With their elegant horizontal vanes that seem to be floating, these shades are a perfect blend of function and beauty. If you intend to complement your contemporary kitchen or balance the look of your vintage cabinetry with modern window curtains, then knowing the meaning of modern when it comes to window coverings is a must. First of all, nothing exudes more contemporary flair than abstract or large geometric patterns in striking colors. 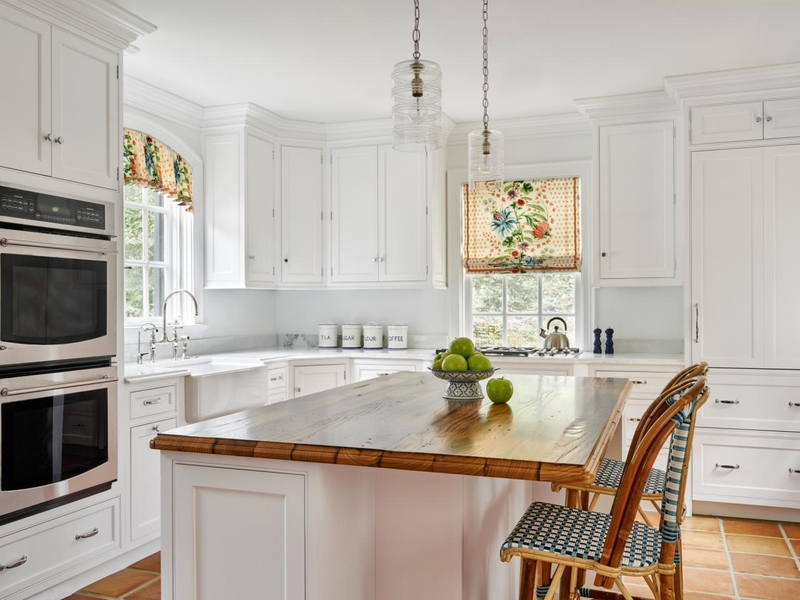 So take a stand and choose bold designs for your kitchen drapes in order to add vibrant pops of color to this hard-working space in the house. Modernity can also mean using the latest low-maintenance fabrics, so choosing moisture and dust-repellent materials is equally important. Go for antimicrobial treatments or resistant textiles that will help you save both time and energy. 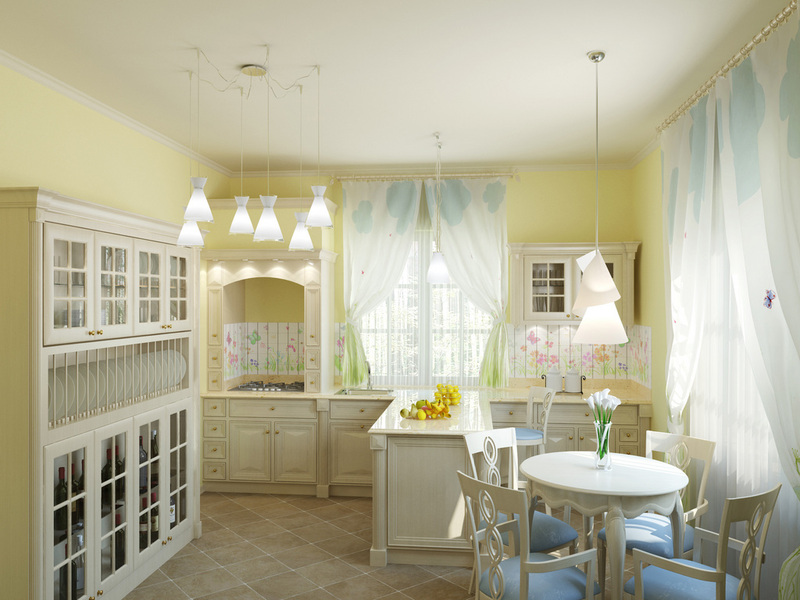 To achieve a perfect country décor in your kitchen, it is essential to get the right window treatments. You need traditional materials like linen, cotton or hemp that bring impressive textural elements, while adding a feeling of coziness. Using coffee bean bags instead of proper curtains is a wonderful DIY alternative. Handmade embroideries will also make great style statements. Design wise, nothing speaks country better than checkered fabrics, but keep in mind that heavy-patterned ones are likely to obstruct your view and impede natural light. Thus, go for simple decorative lines and neutral colors: they will make your kitchen look neat and fresh. Also, remember to pair your rustic curtains with a vintage-looking rod, for complete rural charm. 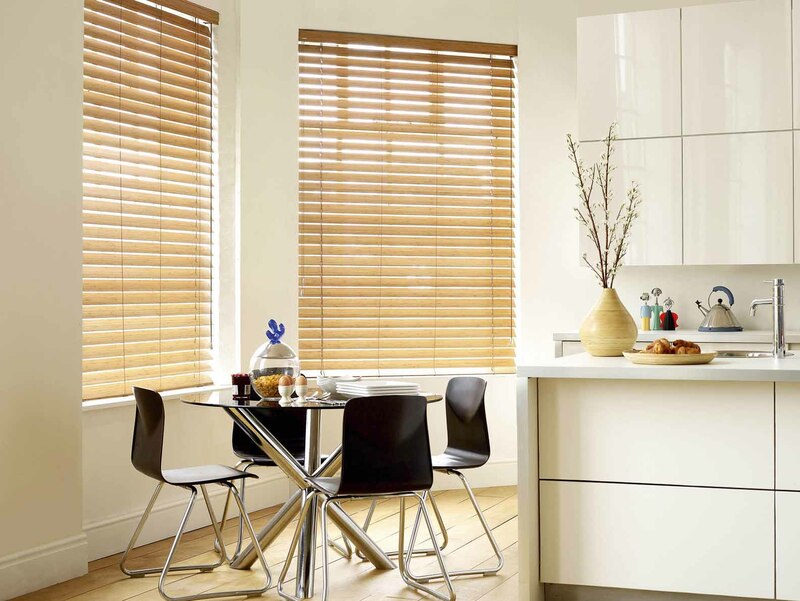 Horizontal blinds work fabulously with crisp contemporary kitchens. Their neat-looking slats and handy stacking system beautifully complement the clean and straight lines of modern cabinets and glossy counter top finishes. Moreover, they offer a wide range of designs and variations: beveled slats will reflect light in a charming manner, emphasizing stainless steel appliances; textured slats that emulate natural wood grains will add depth and interest to your kitchen windows, enhancing their elegance. 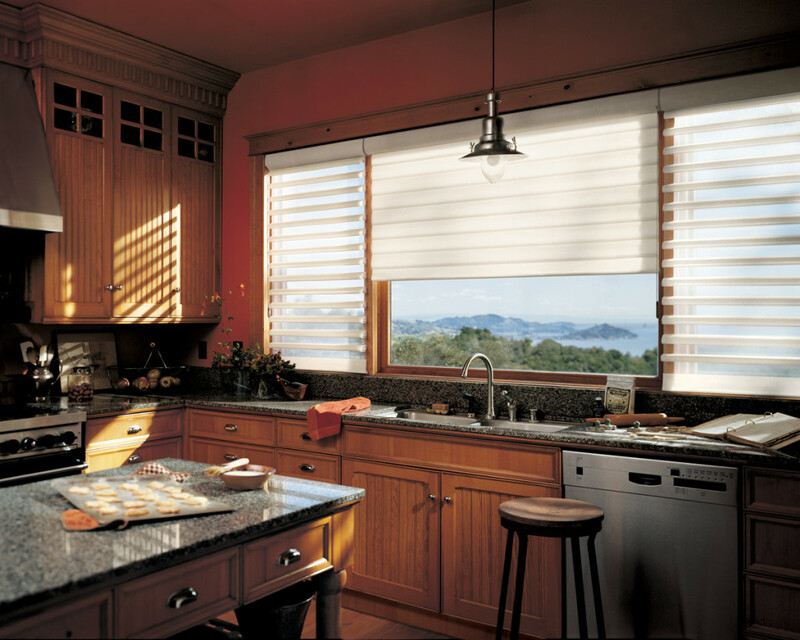 Alternative wood blinds are also capable to withstand heat and humidity, thus they are ideal for intense cooking areas. For a sleek look, choose systems with hidden rails and matching coil inserts. Using long curtains to dress up your kitchen windows will make this hard-working space in your house look grand and aristocratic. Length is important in creating a sense of drama, so pick fabrics that extend from the ceiling to the floor, for extra panache. If it is possible, divide the curtains into two separate panels that can frame the kitchen window on both sides; this is also a great trick to make a small window look larger and impressive. Finally, make sure your long drapes are balanced with extra inches in width, to create rich fabric folds. White is definitely pretentious and you wouldn’t think about using it for your kitchen window curtains – at least not as a first option. But the great visual impact that it creates is worth it. With its crisp allure, white drapery can definitely elevate the look of your aged cabinets, giving a stark Swedish feel to the room. Contemporary designs and stainless steel appliances can be easily softened with lush white fabrics, generating an inviting ambiance. 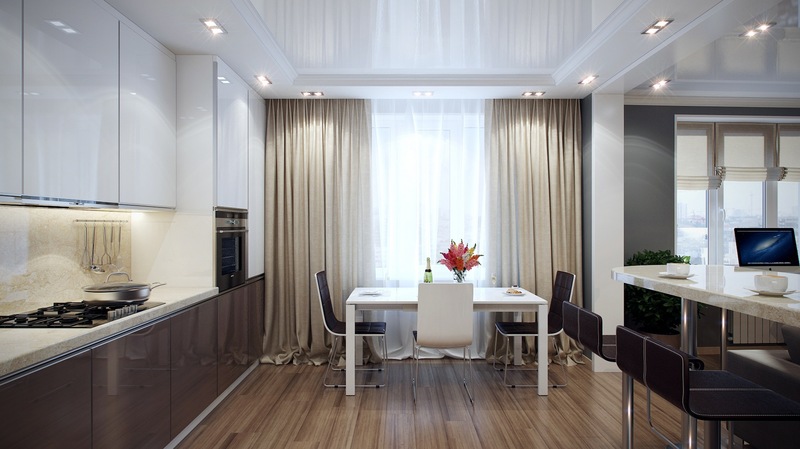 Whatever you do, keep in mind that white drapes will look stunning if you do not skimp on the fabric width and length: long floor-to-ceiling curtains with white rich folds will dramatically improve your kitchen décor. Roller shades provide a simple-to-use system that works very well for kitchen windows: when rolled up completely, they will not come in contact with the cooking grease or steam, so they are likely to last longer and require less effort to clean. Rollers are also easy to install, do not cost a fortune and their minimalist design will go perfectly with any type of kitchen décor. For ornate cabinetry, choose simple sheer fabrics for a well-balanced design; modern kitchens with chrome appliances and stark lines could be complemented by more decorative fabrics, so it is up to you to decide. 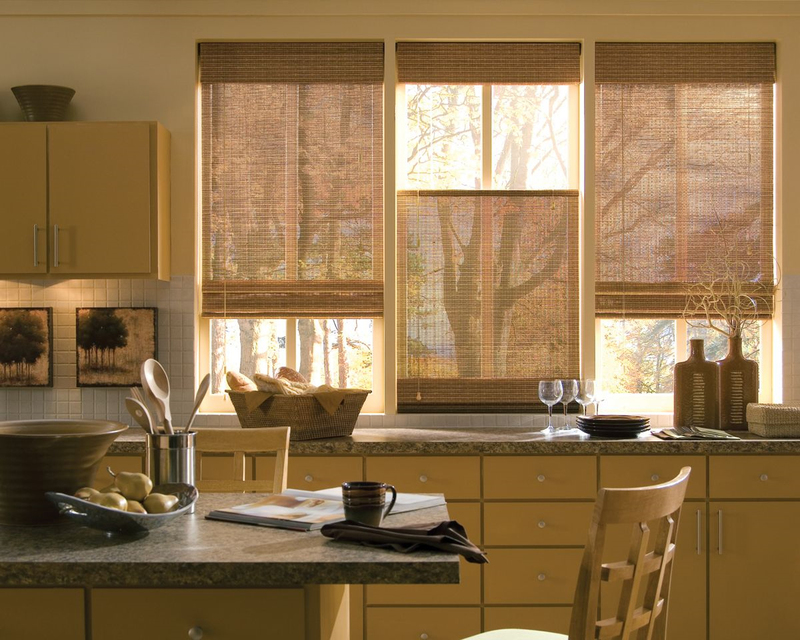 Woven shades will add a natural, refreshing vibe to your kitchen windows due to their elaborate, unique texture. They are available in many shapes and styles (foldable shades, rollers or panels) and their most important feature is durability: organic materials do not fade, crack and they absorb grease, which is essential in the kitchen. Whether you choose from shades made of woven twigs, grass or reed, you are bound to obtain a high-end result. And apart from the textural element that will enhance the chicness of your cooking area, this type of shades will allow natural light in, while providing perfect insulation. 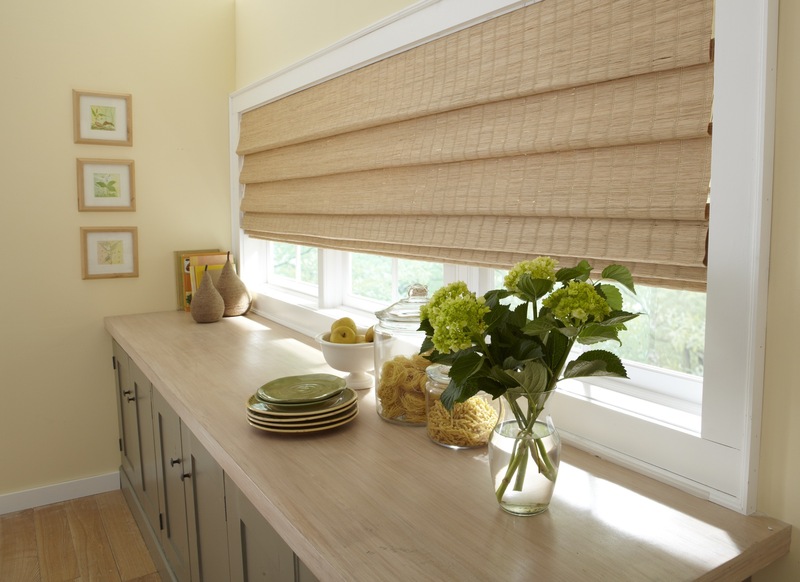 Featuring elegant folds of fabric that graciously stack when rolled up, Roman shades make for a stylish addition to any kitchen, by complementing hefty wood cabinetry or stark chrome appliances. If your window is small, opt for shades with smaller, narrower folds; high or wide window expansions require larger folds in order to balance their silhouette. Pick geometric or abstract patterns to add contemporary panache to a traditional-looking kitchen, or a textured hemp fabric to soften the look of your crisp modern décor. Just remember to hide unaesthetic hardware and dangling cords, for a perfect styling. Using curtains to dress up your kitchen windows is a wonderful way to create an inviting atmosphere. Lush decorative fabrics bring warmth and a feeling of coziness to the space, making you feel more relaxed while dealing with daily chores like cooking or washing dishes. Also, rich curtain folds can make your kitchen look more glamorous, enhancing the natural grain of hardwood cabinets or beautifully contrasting with their tint. You can also use ornamental accents like golden tassels or elegant hooks, for a luxurious note. Due to the fact that curtains add such a character to your kitchen windows, just by changing their fabric or pattern, the space will gain a refreshed appearance, saving you from costly renovations.